This weeks read was provided to me in exchange for an honest review. Elizabeth "Lily" Price refuses to let go of her ex-boyfriend Nate. Determined to have the fairy tale life she has always dreamed of, she goes to extreme lengths to make him realize his love for her. Meticulously plotting the steps to her triumph return as the handsome pilots girlfriend (and eventual wife), there is no line she won't cross to make her dream a reality. 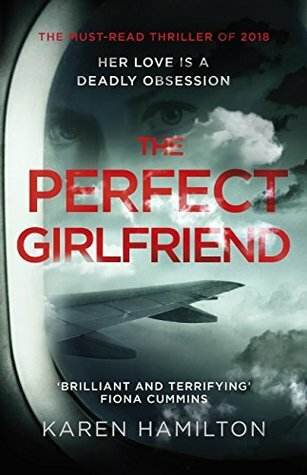 Securing a job at the airline where he works until she orchestrates their re-connection, Lily, now "Juliette" has thought of everything, all in an attempt to win him back. As she spirals deeper out of control in her quest for love, Lily knows no limits to the lengths she will go for true love. Absolutely memorizing! This book had me hook line and sinker from page one and if it wasn't for the aformentioned adult tasks which could unfortunately, not be ignored, I would have read this entire book in one sitting. Lily, or Juliette as she reinvents herself, was an absolutely captivating character. She was twisted and demented, and honestly terrifying. Her love for Nate was so fierce and all encompassing and she went to utterly insane levels in her attempts to win the love of her "soul mate" that it was chilling and more than a little crazy. Her deceit and manipulation were pro-level, that is until she began to spiral too out of control. It was different (for me) to read a thriller from the perspective of the tormentor versus the victim. The thought process behind each of her plotted moves as well as her reactions to those around her was fascinating. I will say I was hoping for a more concrete ending, but I wasn't entirely dissatisfied with this ending. In a way it made it's own sense but as someone who mostly prefers things to have a concrete ending, this one was different. Overall, this was an insanely good read, one I can't suggest enough! The Perfect Girlfriend is set to release in March 2018, go ahead and add it to your TBR list now, you can thank me later! See you next week for another brand new book review!